The Unemployment Rate in the U.S. dropped to 7.0%, and this managed to happen even with the Participation Rate unchanged. 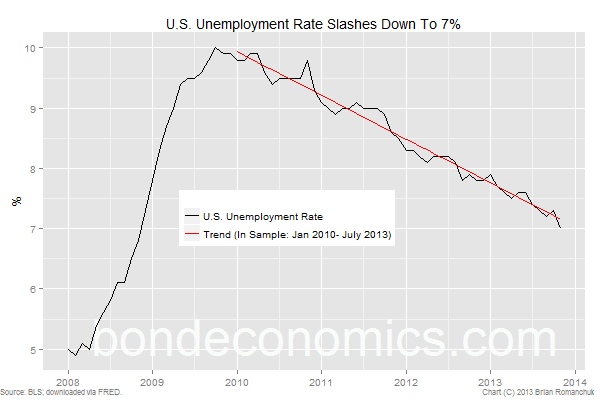 The Unemployment Rate remains close to its downward trend line of the past few years. 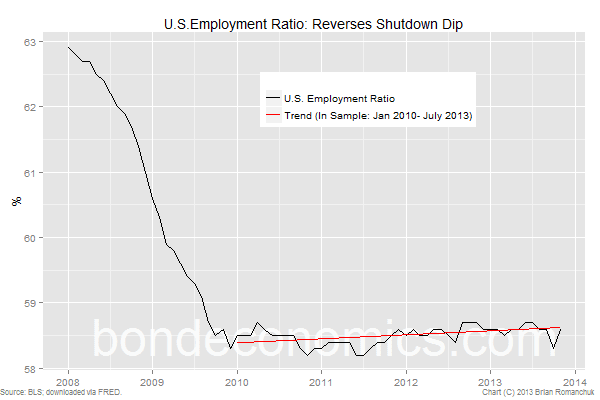 The Employment Ratio reversed its loss in October (due to the shutdown), and is back on the trend line. The data remain on their low frequency trend line, so the results are not really a surprise. However, by hitting the magical level of 7.0%, the Fed will find it a lot easier to do what they seem to want - start "tapering" their purchases of Treasurys. The more important question is the timing of the first rate hike, which is a much more difficult to time, given the incoherence in these trend lines. However, it seems that participation rate should stop falling by the end of 2014, in which case one of the trends I outline above must break. The Canadian Labour Force Survey was largely uneventful. 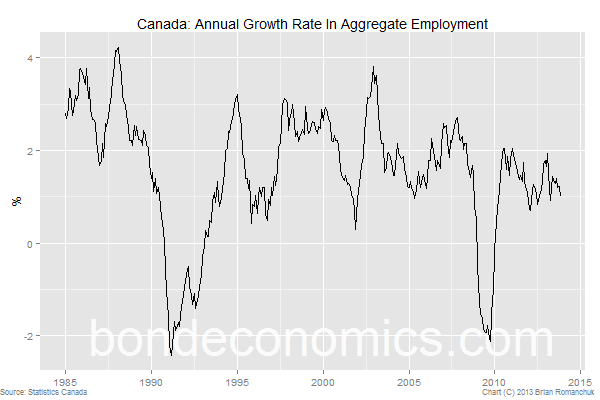 Year-on-year employment growth is stagnant near 1% (chart above). Construction jobs fell, but the breakdowns within the data are very volatile on a monthly basis. The Unemployment Rate has stopped falling, and has been at 6.9% for three months in a row. Perhaps there is a wall at 6.9% that the U.S. Unemployment Rate will run into as well?